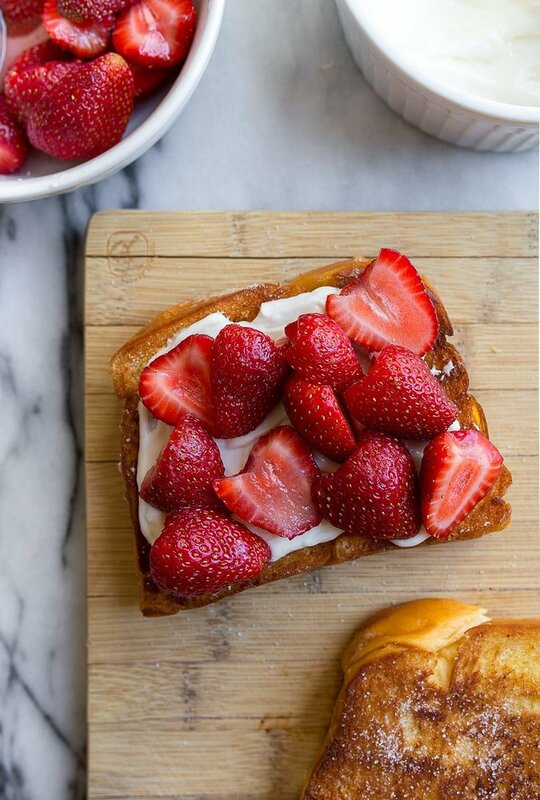 Strawberry toast with cheesecake spread! Use toast to make lazy girl cheesecake: toasted brioche covered in an easy cheesecake dip topped with strawberries. This post was lovingly sponsored by Kerrygold. I’m so grateful for their buttery support. Since we’re long in the habit of admitting guilty pleasures in the kitchen (homemade Star Crunch, anyone? ), I feel like it’s time to introduce you to my long-standing love: cheesecake toast. Last week, a nasty 48-hour bug ravaged through my household. Luckily, we were all hit about 36 hours apart, and so right as Camille was coming out of it, it took me down, which left my husband to care for me. And then when he went down 36 hours later, I was there to care for him. It was ROUGH. One afternoon, when Camille was in the depths of it, and I was on the verge of it, we needed a snack. Camille had just woken up from a nap ravenous, and I realized that I hadn’t eaten lunch because I was so busy trying to get work done before the plague hit me (also ravenous). I had a bubbly loaf of brioche in the freezer, and knew it was time to introduce my kid to my guilty pleasure: cheesecake on toast. More specifically: strawberry toast with cheesecake spread! Cheesecake on toast has a few steps, but the end result is definitely worth it. And I say that as I swipe away cheesecake from my face. First, slice brioche at least 1″ thick. I love brioche because after toasting, it is crusty on the outside, but still soft and fluffy on the inside. Butter each side of the brioche generously, and sprinkle lightly with sugar. 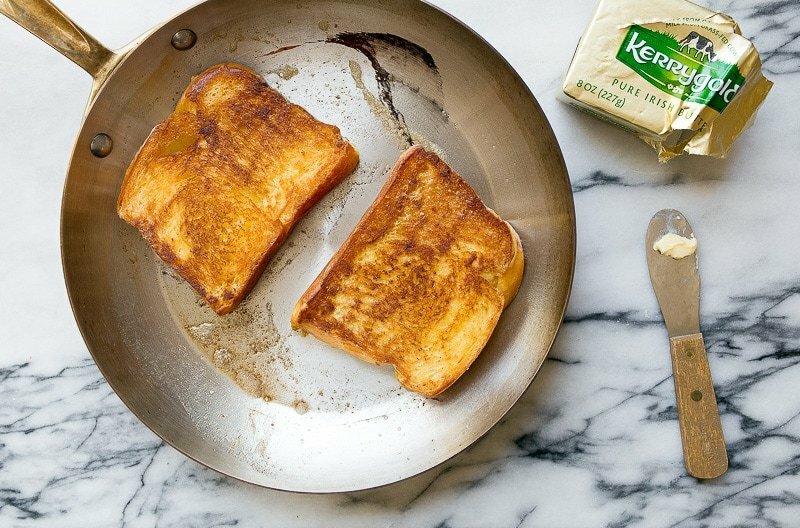 Toast the bread on each side in a skillet with more butter. Yes, more butter. Do not judge the ways of cheesecake toast. While the bread toasts, slice up the strawberries and add a pinch of sugar (or honey) to help them soften and marinate in their own juices. When I’m serving this to Camille, I don’t add the extra sugar on the toast or the strawberries–I’m one of those Moms that tries to limit her sugar intake as much as possible. But for me? All the sugar, please and thank you. Next, whip together the cream cheese and powdered sugar (again, if I’m making it for Camille, I use honey or coconut sugar). 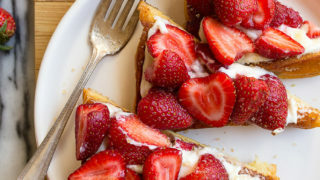 Spread the toast with the cheesecake filling, and top with the strawberries. 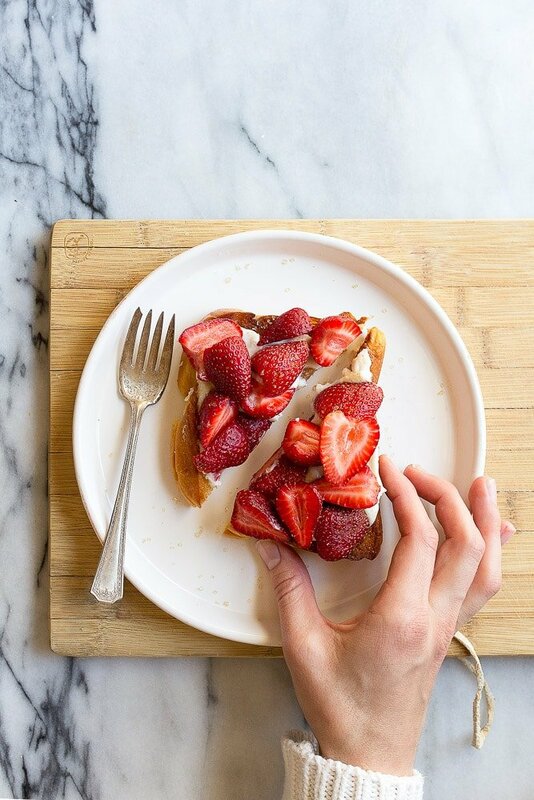 Sprinkle on some coarse sugar for crunch, and then DEVOUR this strawberry toast! 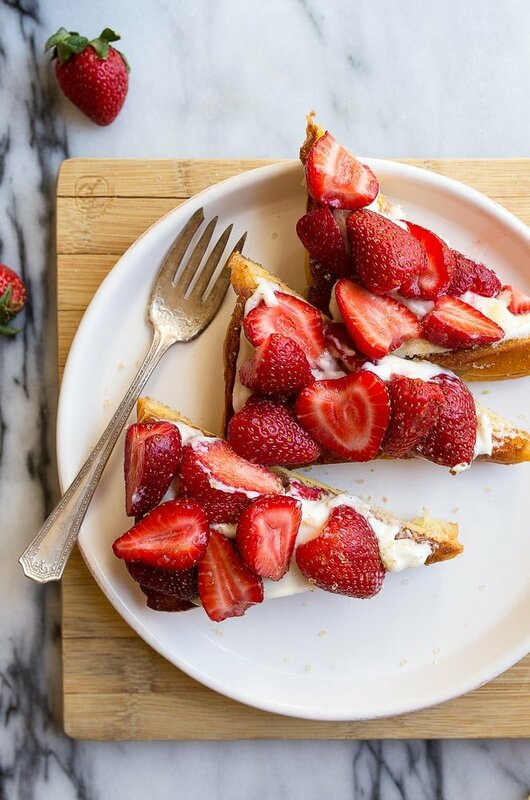 Strawberry Cheesecake Toast for Two. Preheat a skillet over medium heat, and add 1 tablespoon of the butter. Butter each side of the bread with the remaining 2 tablespoons of butter. Sprinkle each side of the bread with the granulated sugar before placing in the skillet. Toast the bread on each side until golden brown, about 1 minute per side. Meanwhile, slice the strawberries and toss them with 2 teaspoons of powdered sugar. Set aside. In a small bowl, beat together the cream cheese, remaining 1/4 cup of powdered sugar and orange zest until fluffy. so. this might be on repeat as soon as i get my hands on some strawberries. on another note, have you tried strawberries dipped in sour cream, then brown sugar? also delicious, also dangerous. Oh, yeah! I haven’t had it for years, but I loved it as a kid. It’s also good with sliced apples and grapes. Thanks for bringing back some great food memories! PS. We’re in the middle of that crud, whatever it is. My husband and our oldest have it, but our youngest and I are so far, so good. Fingers crossed ???????? 3/4 of my family caught that. I have never been so tired in my life! It took me about 2 weeks to fully recover…hope you’re all feeling 100% soon! The recipe was too good to pass up. However, I didn’t have ant brioche so substituted my homemade sourdough bread with delicious results. The flavors complemented each other beautifully. Thanks for the recipe. Sadly, there’s no brioche available…Any other suggestions? Oh my, I’m probably going to be in love! I have eaten softened cream cheese on toast for years…always delicious and the texture is perfection. The simple recipes are always the best. Will definitely keep this one in mind and get some strawberries, yay!